In recent days Kishinev, the capital of the Republic of Moldavia, was the scene of several violent demonstrations, recalling the Velvet Revolutions of 1989 against the Communist dictatorships in Eastern Europe. Whatever will be the outcome of these popular actions, we must remember the geopolitical destiny of Moldavia — a destiny that this popular outcry is trying to change. If it is possible today to find a product of Stalin's vision still surviving in Europe, it would surely be the Republic of Moldavia. Created in 1918 on the left bank of the river Nistru, this republic was in Stalin's opinion a window for the U.S.S.R. to keep the option of the long march to Istanbul open. The country was at that time only an autonomous republic placed under the control of the Soviet Republic of Ukraine. It was host to the greatest Soviet army, Ukraine south, that was destined to conquer Romania, Bulgaria and open the road for the Soviet Army to Istanbul, "the City of the Tsars," as the Russians knew it. In 1944, when the Soviet army was winning the Second World War, Stalin decided to restructure the so-called autonomous republic and make it a Soviet Republic with the capital in Kishinev, offering as territory the ancient Romanian province of Bessarabia. The geopolitical concept behind the new Republic of Moldavia remained unchanged. In the Cold War years the top Soviet army was stationed there. The 14th Army from Tiraspol had the same military objectives — conquering Turkey and the Middle East. Also, Moldavia hosted the region's most important military supervision center, telecommunication interceptor, and factory for short-range rocket and military equipment. When the Soviet Union collapsed, the Russian Federation decided to maintain control of this territory for various reasons — while the Republic of Moldavia was under Russian control, the hope to reconstruct the southern part of the Soviet Empire was still alive. Moldavia was a factor in attempts to threaten Romania and keep a window open to the Balkans for the strategic purpose of surrounding Ukraine, thus stopping any attempt of Kiev to halt Russian encirclement. It would also create a possible European-NATO destiny for Ukraine. Russia thus concentrated all its efforts in 1991 and 1992 to maintain Moldavia within its sphere of influence. A rebellion was organized with the support of 14th Army in Transnistria, a small Moldavian province at the Ukraine border. A military factory was located in Transnistria, along with the army barracks, neither of which Russia was eager to lose in favor of the new state. Finally, after the 1991-92 Transnistria War and the Russian military direct intervention, a coup d'état was staged at Kishinev and the democratic prime minister at that time, Mircea Druc, was deposed and forced into exile. From that time Russia has supported puppet regimes in the Republic of Moldova who agreed to joining the Community of Independent States, signed a treaty with Russia, and created an economy dependent only on the Russian market and support. During this time Russia did not evacuate Transnistria, nor supported the integration of the rebel province into Moldavia (a similar scenario to Abkhazia in Georgia), and created a mafia state supported by the illegal arms supplies to countries from Zaire to Rwanda to Saddam Hussein's Iraq. The Republic of Moldavia remained under Russian control even in 2004-05 when the Orange Revolution occurred, an attempt to orient the region towards the United States and the European Union. But in 2007-08 the landscape changed to compliance with the Russian Federation's political views. Many factors have contributed to the rapid deterioration of Moldavia's economic situation, decreases in wage and pension values, growing unemployment and the Russian reduction of subsidies. The final blow to the economy came in January when the Russia-Ukraine gas row practically produced the collapse of Moldavian budget. However, for the first time in the last 20 years a real European influence in the region was felt, with E.U. missions and investments creating a feeling that finally Russia had a geopolitical counterpart and that a new vision for Moldavia could be possible. 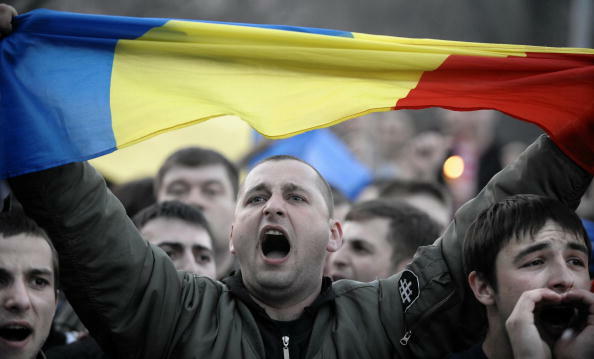 The Romanian economy's rapid development created a magnet for a Moldavian population that is Romanian in origin, language and history, and started a hope that Romanian support for an E.U. enlargement regarding Moldavia could be possible. This new political backdrop made the political powers at Kishinev even more hard-line — Russian relations were heightened, the border with Romania was shut, and Romanian media banned from Moldavia. In this Cold War atmosphere the Communist power at Kishinev was sure of winning the election. The fact that the Republic of Moldavia is not meeting any democratic criteria is not a surprise to anyone. The national television and radio stations are under state control, the opposition is not allowed participation in the state media, the newspapers are controlled, and the economy is under state regulation and local mafia power. The Apr. 5 elections were held after two month of violent verbal assaults on the opposition from the government, massive pressure on the opposition media, and the banning of opposition gatherings. The long list of irregularities could go on forever. Finally, on Election Day, 35 percent of the Moldavian population decided to go on holiday and voted on the supplementary list (without paper control), which is very strange as in general this number is no greater than 2 percent around the world. The population of Moldavia loves traveling on Election Day, it seems. It was no surprise under these conditions that the Communist Party claimed victory with 50 percent of the vote, even better than pre-election predictions. This was a mistake; the opposition was ready to accept an election negation for a power sharing deal for a slow democratization, but this result showed that the Communist Party wanted to rule alone with no possible compromises. This sparked the popular discontent and led to massive demonstrations in Kishinev. Unfortunately this popular action has little chance to change anything. The United States has adopted an appeasement approach towards Russia and President Obama is not acting as former President Bush did during the August 2008 war in Georgia. So there is no chance of an American support operation for a late Orange Revolution. The E.U. is also eager to strike energy deals with Russia, and does not want to further antagonize its leaders. Finally, Romania is crippled by economic problems, and a president in a corruption scandal who is seeking reelection in what looks to be a hotly contested election at the end of the year. In this political landscape, the geopolitical destiny of the Republic of Moldavia will remain the same, firmly in the orbit of Russian influence.